Again, things have been quiet from me over here. Things have been crazy lately, not only here in Boston due to recent events, but in my own life, in my work life, and no matter who I ask they will not put more hours in the day for me. Sup? How am I supposed to get this stuff done?! 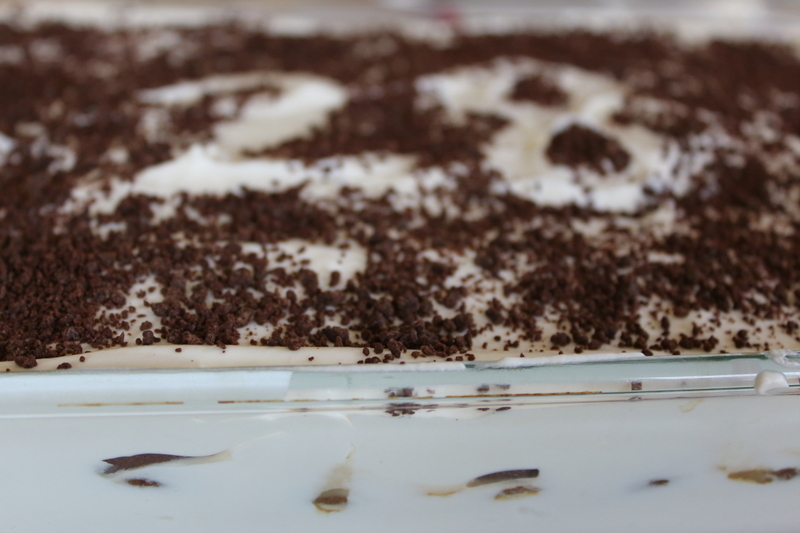 I ain’t no slouch, so when my friend asked me to make a tiramisu for his birthday, I was happy to do so. One of my hangups is that I can’t frost a cake worth a damn. One of my favorite features of a tiramisu is that you don’t need to get serious about what it looks like, cause it just needs to look edible and that’s not hard. I cut out a “2” and an “8” out of parchment paper, and pressed them lightly into the top layer of whipped cream and mascarpone mixture. I tossed some semi-sweet chocolate chips into my lil prep food processor and ground them down. Once I’d sprinkled the chocolate all over the cake I carefully peeled the parchment paper back up. Ta-dah! Happy 28th, buddy! ← Boston, you’re my home.